We offer facts and opinion in equal measure here. 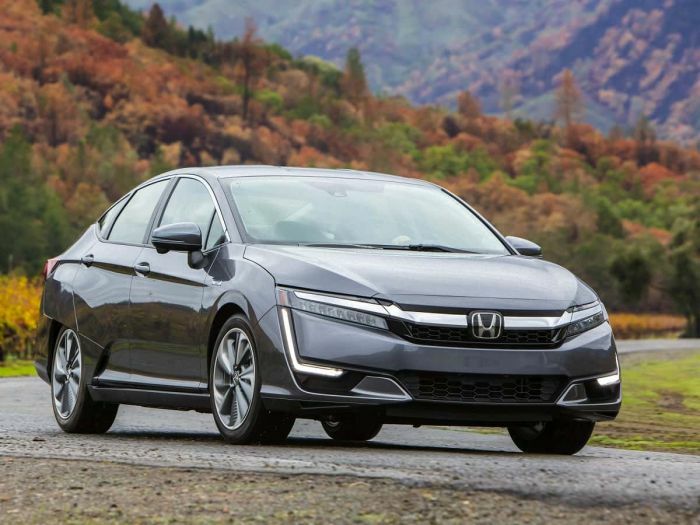 See what we think of the new Honda Clarity PHEV and challenge our conclusions. The Honda Clarity plug-in hybrid-electric vehicle (PHEV) is a midsize, five-passenger car that can operate as an electric vehicle or as a hybrid electric vehicle. It is Honda’s newest addition to an already very green lineup. We found the Clarity’s many strengths included a sophisticated, Zen-like ride, an impressive all-EV range, and seamless hybrid operation. Like many green cars today, its after-incentives price is also remarkable. The Clarity is about the size of a Civic, perhaps a bit larger, but it has its own Honda styling. The car has a large trunk area, a roomy cabin, and would serve a family very well if their needs worked with a midsize sedan. Inside we found the Clarity relatively roomy, but our right leg contacted the wide decorative center console on hard plastic during the entirety of our drives. If you are under six-feet tall, this may not be a problem. This was the single imperfection we found. Truth be told, most plug-in hybrid electric vehicle owners use their cars almost entirely as EVs. So much so that these types of cars actually have programming to refresh fuel before it gets stale. Unlike battery-electric vehicles (BEVs), there is never any range anxiety in a Clarity PHEV. When fully energized, you can drive it for 48 miles on electric power and then continue on to a total of 340 miles under hybrid power. You can then stop for literally five minutes and drive another 290 miles. To cover this amount of ground in a Clarity BEV you would need to stop to charge the car multiple times using a high-speed charger for about five hours in total. If you can find a charger on your route. And that assumes it is not occupied. This is why PHEVs work better as primary vehicles for families as opposed to affordable BEVs. You don’t have to keep an ICE car for vacations, driving kids to college, or other long trips. The Clarity boasts a 110 MPGe rating, just 4 MPGe lower than its BEV sibling. It can also operate as a 42 MPG hybrid when it is depleted of charge. The EPA says your energy costs will be about $700 per year in the Clarity PHEV. Since gas is affordable, and electricity is not in many areas, the Clarity BEV will cost you $600. Why buy a BEV with a range of 89 miles when you can buy a PHEV with an EV range of 48 miles and a total range of 340? We don’t mean that rhetorically. Why would you do that? Please tell us below in the comments section if you can think of a justification. Even though the BEV Clarity was launched many months ahead of the PHEV, the PHEV Clarity is outselling the BEV by about 8 to 1. The Clarity is buttery-smooth in all situations. It is also almost silent in operation in all situations. Honda has a gas engine in there somewhere, but it is hard to tell when it engages or disengages. It’s that seamless. Even after you deplete the all-EV-range of 48 miles, you will still be covering a lot of EV miles. The regenerative braking adds a lot back. By the way, if you want to feel that regenerative braking Honda has paddle shifters (see video at bottom of story), but if you want the brakes to feel totally normal, do nothing. Drivers can also opt to use the EV-range where it has the most impact (in town and in traffic). If you have some open highway ahead, tap HV mode and cruise efficiently using a sip of gas. Then return to PHEV mode when you exit. Smart. Most PHEVs have this simple feature, but most don’t couple that with an impressive 48 miles of EV range. In addition to its refined drivetrain, the Clarity also is silky smooth over all road surfaces, even broken up roads. This car is really special. If you like your car to be silent and comfortable this is the car for you. If you want a more dynamic driving experience Honda is still your brand. Start your search with the very diverse Civic line. You really can’t beat the Civic for bang for the buck. The last two we tested returned 40 MPG in real world driving. Speaking of bang for the buck, our $37,490 Clarity Touring trim sure sounds expensive. Except, as all educated green vehicle consumers know, nobody – ever – pays full price for any green car in this country. We tested the Clarity in Massachusetts. The state has done an admiral job of corralling together all the green cars available locally on its Drive Green website. It shows the green cars available from specific dealers’ inventory and the cost at the end of all the discounts and incentives. The Clarity Touring presently sells in my area for about $22,000. That is roughly half the price a smaller Tesla Model S costs buyers in my area. Remember, Tesla lied to you about the $35K starting price. Nobody has bought a Tesla Model 3 for less than around $40K after incentives in my state. Most paid more. And that Clarity price comparison is for the fully-loaded Touring Clarity vs a base Model 3. Base Clarity cars are selling for as low as $19K right now in both RI and Mass. (These two states combine their green car websites). As good as the Clarity is to drive, we were even more pleased with the Clarity’s interior. No pretend-green plastics seats (Tesla). Honda went with perforated leather. No recycled hemp waste for the dash (BMW). Honda instead chose premium microfiber and stylish matte wood. This is a car that has many luxury elements more expensive competitors do not offer. The infotainment system is also a breath of fresh air. A big, clear screen with no clutter is the centerpiece. Honda offers both Apple CarPlay and also Android Auto. No Tesla offers this. No Toyota offers this. No Lexus offers this. We rocked Waze and Pandora from Android Auto and found Honda’s system one of the best in the business at any price point. This is modern infotainment at its best. You will love it even more if you are not a fan of knobs. Suddenly, the world is awash in affordable fantastic compact and midsize cars with PHEV drivetrains. We have tested the Hyundai Ioniq PHEV and liked it. We also remain loyal Prius Prime fans here at Torque News. However, this Clarity seems bigger, more refined, and simply better than what the competition has been offering at this price point. This new Clarity is a hard car to ignore if one is shopping for a green car. Simply said, it would be our first suggestion to anyone who wanted a green car. That said, are you shopping for a car of any type? Most people are not. Crossovers are all the rage and they have the cargo, lifestyle, safety, and visibility benefits to justify that popularity. As much as I loved this Clarity one thing haunted me the week I tested it. Why didn’t Honda use the all-wheel drive CR-V platform for its latest PHEV? That’s a vehicle we think the public is dying for. If Honda or any leading affordable automaker wants to put up big green vehicle sales numbers it need only bring us a green vehicle as good as this Clarity but packaged as an AWD compact crossover. Been driving my Touring for three weeks and have yet to find a downside to this car. Great ride, very quiet and have used zero gas as my commute is 40 miles round trip - and I charge for free at the office. Hugs the road very well, has great pickup (ok it’s not a sports car), and very comfortable. Crazy incentives in MA to buy this car. Traded in my 3 year old accord plus $900 for a brand new touring. Many of the key parts have a 15 year warranty. Can’t figure out why these aren’t selling better, other than the dealers don’t know how to sell the car and Honda doesn’t advertise. Actually, the Clarity is not Civic-sized. It's longer than an Accord by less than an inch. This is the most comfortable car I've ever owned. Last weekend we drove 640 miles and achieved 49.6 mpg in Hybrid Vehicle mode with no EV travel to skew the numbers. The reason there are many more Clarity PHEVs than BEVs is because the PHEVs are available in all 50 states and Canada but the BEVs are leased only in California and Oregon and they're not always available, unlike the PHEVs. The lease deal on the Clarity BEV is very nice, which makes the 89-mile range easier to accept if you have another vehicle for long-haul purposes. Finally, the Clarity's 17 kWh battery wouldn't fit into the current CR-V. The larger Pilot has more room and will soon appear as a Plug-In Hybrid. It will be interesting to see if Honda prices the Pilot PHEV as aggressively as the Clarity PHEV. Good insight on the size, and thanks for the opportunity to add some clarity to my size estimation (Are two puns in one sentence allowable ;) The Accord has 106 Cu ft of interior volume. The Clarity PHEV has 102 and the Civic 4 door has 98. The Accord Hybrid has a 17 cu ft trunk, the Clarity has 15 cu ft and the Civic has 15 cu ft. So, the Clarity is a bit bigger than the Civic sedan inside but smaller than Accord inside. My specs per the EPA's site. I'm sure this is all due to putting a 17kW battery in the car. The Clarity is larger and more comfortable than a Civic. We have a Clarity and love it. No car is perfect, and we agree the CR-V with this drive train would have been our choice had it existed. But the Clarity comes close to perfect for us. We drive 100% electric for weeks at a time, then use the gas engine in hybrid mode for trips out of town over 50 miles. The car is roomy, comfortable, corners much better than it should, has decent tech features, and the ride as you said is buttery smooth. Plenty of power too. We charge the car using our house roof solar; try that in your fuel cell car. We bought a Clarity when it was launched in Dec 2017. Loved it. Where did you find this? 'have programming to refresh fuel before it gets stale' I actually worry about keep the gas in the tank for too long without using it. In your article you said, “Why buy a BEV with a range of 89 miles when you can buy a PHEV with an EV range of 48 miles and a total range of 340? We don’t mean that rhetorically. Why would you do that? Please tell us below in the comments section if you can think of a justification. Even though the BEV Clarity was launched many months ahead of the PHEV, the PHEV Clarity is outselling the BEV by about 8 to 1.” Have you considered that one of the reasons the PHEV is outselling the BEV nationally is the that BEV is only available in California and Oregon? Have you also considered that the BEV is only available as lease option and cannot be purchased? The truth of the matter is that the BEV is a compliance vehicle and Honda is practically giving them away for a $200 a month lease payment which is close to half what the PHEV would cost as a lease vehicle. There is a limited supply of Clarity BEVs in California and most Honda dealerships are only getting one or two a month so there is a waiting lists six months to a year long for folks wanting to get in on this fantastic lease deal. I have a Clarity BEV and it is a wonderful option as a commuter vehicle. I have a 20-mile commute and I park in a city garage where I get a $100 discount on the monthly parking rate for driving a ZEV. I would not get that discount for the PHEV. I also get free electricity at the city garage so my marginal cost of ownership is close to zero. Since I still have my SAAB 95 for longer trips, choosing the BEV over the PHEV was a no brainer. Brian, thank you for taking the time to add this info. It's great to hear from a Clarity BEV owner with positive things to say. Honestly, I didn't realize just how restricted the "sales" of the BEV were until after I posted the story. One thing I did think ahead to was the way the PHEV can be a single car for a family that also has longer range needs. Keeping a second car can quickly negate some of the cost benefits of a BEV. That said, in a household with two commuters, a second car is usually a reality anyway. John, I think you meant to say that keeping a second car can quickly negate some of the cost benefits of owning a PHEV. Since about 98% of my driving is local, I am loving my Clarity BEV and haven't had a moment of range anxiety. The cost savings is huge and it is a thrill to drive. I’m highly considering purchasing a Clarity PHEV since I got rear ended and my Accord was totaled. However after test driving one at a dealer that had insufficient charge and ran on gas only, I feel unsure. The transmission seemed too rev oddly high and was very loud/strange to me. I acknowledge that this probably won’t matter much in the end since my commute to work is 44 miles round trip and I can charge for free at work. Going to test drive again because I really want to like the car. It’s very practical. I also want a “green” car with little to no gas costs, otherwise I’d for sure go with the HR-V as I love the size and style of it. I really wish Honda made the HR-V in a PHEV. They are doing a big disservice to themselves for not having that in my opinion, and I hope to see it in the future. Lauren, This is all too often a story across the country. The Honda salespersons do not seem to be good understanding, or selling, the Clarity. There are many comments on the internet about test drives with a flat battery. The truth is up to the EV range of the car, somewhere in the high 30's to low 50's depending on the ambient temperature, you can drive in 100% electric mode quite easily without tripping the engine. We drive for weeks at a time without the engine ever coming on. Then when we are on the highway taking an out of town trip we will switch into HV mode which is Hybrid Vehicle. In HV mode the car switches between the engine running to add power to the battery + to the drive motor, and electric mode (EV). The engine will turn on and off without us noticing. Without looking at the dashboard display I can't perceive if the car is in EV mode or HV mode. However there are times when we do hear the engine. It's important to know that the gas engine normally does not connect directly to the wheels (it does under certain circumstances). The gas engine's job is normally to supply electrical power to the electric motor that drives the wheels. So the speed at which the engine runs has no relationship to the speed of the car. The engine may run fast to both supply power to the drive motor and to recharge the battery. In some cases the engine will run fast and noisy. There are even times when the engine runs so fast we've deemed it "angry bees" mode. While a little disturbing this is normal, but rare. Our Clarity has over 17,000 miles and I've only heard the angry bees sound once which lasted a short time, like 5 minutes. Most of the time we never hear the gas engine either because the car is in full EV mode, or because Honda did such an amazing job of having the gas engine come on and off without being able to notice. Many of us await the day Honda puts a Clarity like PHEV package into a CR-V or HR-V. I'm sure you will be pleased if you get to demo a Clarity with a charged battery. Good luck with your decision. We love the car. I have to echo the comments you received. I traded in an accord for the Clarity and am very happy I did. The car is almost as spacious as the accord and fits my three kids in the back. Electronics are similar to my 2016 model so they were very familiar. Car drives very nicely and it is quiet. What you saw when you did your test drive is nothing like the EV driving you experience with a full battery. I have a 40 mile round trip commute and charge at the office. Plenty of battery for the round trip. I’ve driven over 1200 miles and used less then 3 gallons of gas I total. You won’t be disappointed with the Clarity- and saving a bundle with the tax credit certainly is nice too. It only takes an hour of charge time on 115v to put about 4 miles into a Clarity. That's all you need for a decent test-drive. Why not just call ahead and ask the dealer to plug it in? Absolutely love my Clarity PHEV. I would never buy an ICE-only car again. The driving experience in EV mode is far superior to an ICE-only car. Finally an affordable mid-size car with very usable EV range. It does beg the question why someone would buy a BEV car. I considered a Bolt and Model 3 but decided I didn't want to deal with the hassle of trip charging planning and range anxiety (don't we have enough hassles in life already?). The Model 3s price is out of line for what you get, IMHO. Kudos to Honda!! Ps: I'm a muscle car guy (last one was my 2015 Mustang GT Premium) and I'm a convert to EVs! Superb, what a webpage it is! This webpage gives valuable data to us, keep it up. I real pleased to find this web site on bing, just what I was searching for :D likewise bookmarked. Any idea when the 2019 model PHEV Clarity will come out? Any idea if there are meaningful changes from the 2018? Right here is the right blog for anybody who really wants to find out about this topic. You know a whole lot its almost tough to argue with you (not that I really will need to...HaHa). You definitely put a brand new spin on a topic that's been written about for years. Wonderful stuff, just wonderful! Why not a CR-V as a PHEV? The clue is if you look at the Chrysler Pacifica PHEV. When you have a heavy tall vehicle it takes a lot of battery power to move it. So you either have to spend double as much on batteries, putting you in Tesla territory, or you have to accept siginificantly less range -- the Pacifica's battery-only range has been around 25 miles in real world tests. If Honda tried to keep the CR-V's price down by using the electric bits from the Clarity PHEV, you'd be blasting it for its short range. If they tried to give it decent range by adding more batteries, you'd be blasting it for its high price. In short, there's no "win" for a PHEV CR-V.
One thing I can't figure out. The PHEV Clarity's drive motor is rated at 181HP, same as the Accord Hybrid. The gas engine is only 103 HP, compared to 143 HP. Yet both claim a total system power of 212 HP. Any idea how that number is determined? BTW, the only time both propel the car together is cruising at highway speeds (I.e., low power).